Soren Kierkegaard was a Danish philosopher and an author. He was born in 1813 in Copenhagen as the youngest of seven children to his Jutlandish parents. Soren used to call himself “a child of age” as his mother was 45 and his father was 56 at his time of birth. He was influenced by his father’s devoutly religious teachings that concentrated on the suffering of Christ. He began studying theology, literature, and philosophy in 1830 at the Copenhagen University. During the early days of his career, Kierkegaard wanted to avoid dealing with only one definitive philosophical or religious position. In 1837, he moved from his hometown to teach Latin in Borgerdyskolen before his father’s death in 1838. He entered into a life of seclusion to concentrate on his writing and publishing his work constantly for a period of ten years. He completed his doctoral dissertation in 1840 that he entitled The Concept of Irony. He published this book one year later. The book, along with several others, was contradicting Hegelianism, the main German philosophy during his time. Kierkegaard believed that belief in God is an act of faith and not a solution to theory problems. Most of his work expressed interest in religious issues including Fear and Trembling, published in 1843, The Concept of Dread in 1844, The Sickness unto Death in 1849, and Purity of Hearts is to Will One Thing of 1847. Most of his early work was published under pseudonyms, something which was not looked favorably upon by other authors. During his career, Kierkegaard made several publications that touched on Christianity and philosophy. In his book Concluding Unscientific Postscript, published in 1846, he urged Christians to reject Hegel’s system, claiming that human existence cannot be explained objectively. He published Works of Love, a piece on love in various forms, in 1847. 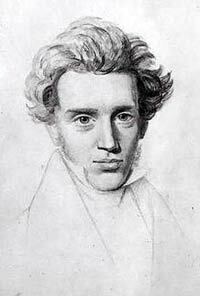 Kierkegaard had a spiritual crisis in 1848 when his work began to attack the church and the complacency of Christians. He wanted to anger the Christians in order to inspire their faith. He published Practice in Christianity in 1850 under a pseudonym. He felt that this was his most important book and he took it as a reintroduction of Christianity. He wrote several articles for journals, including The Fatherland, which criticized the Lutheran church. In between publishing works about the church and Christianity, Kierkegaard had other works published as well. In 1846, he published a critique of the philosophical system entitled Concluding Unscientific Postscript. He also influenced several other philosophers during his time, including Heidegger, Jaspers, and Sartre. Kierkegaard’s work has also influenced theological studies over time, especially Karl Barth’s work and others. Before he published the temth issue of his famous work The Moment, Kierkegaard collapsed on the street and was taken to a hospital. He stayed in the hospital for over one month before he died on November 11, 1855. Kierkegaard was buried in Assistens Kirkegard, Copenhagen, in the Norrebro Section.